(CNN) – As recently as last week, Newt Gingrich's communications director has been criticized by editors on Wikipedia for dozens of edits he has made and requested in defense of his candidate. While some of the changes were minor, Joe DeSantis has removed or asked to remove factual references to Gingrich's three marriages as well as mentions of ethics charges brought against him while he served as speaker of the House. These efforts continued as recently as Monday. Wikipedia records show DeSantis has made over 60 adjustments to entries in the online, publicly-edited encyclopedia to the biographical entry on Gingrich, the similar page on his wife, Callista, and a separate page on one of their books, Rediscovering Good in America. DeSantis has actively lobbied for changes to the articles since mid-December in a discussion forum called "Talk" on the site, and previously from May to June of last year, though his most recent direct edit to the site was in June of 2011. Last Tuesday, DeSantis drew the ire of an editor on the site. "I'll raise the question in the appropriate place, but I have to say this micro-managing by a Gingrich campaign director is a matter of concern to me even though you now are identifying yourself. Pointing out factual errors is one thing, but your input should not go beyond that, even here on Talk," the editor known as Tvoz, wrote on a page devoted discussing possible edits. The site has a conflict of interest guideline which suggests that individuals should not edit "on behalf of clients," or on subjects to which they have "close relationships" or "financial interest." But the site does allow "non-controversial edits," and DeSantis has a profile on the site which identifies his relationship to Gingrich. "I stopped making direct edits in May 2011 because I was alerted to the COI rules," he said. "Earlier I thought that simply disclosing my affiliation was enough but it wasn't. So I started posting requests on the Talk page. "This has been far more successful and the other editors on Wikipedia have largely received this very positively," he continued. But several editors on the site have taken issue with his edits and requests. "The fact that Callista is Speaker Gingrich's third wife is well-known and indisputable. Please do not remove it from her biography," wrote editor Cullen328. "Instead, please defer to the judgment of experienced editors, and raise your concerns on the talk page. Thank you." But other editors have been more sympathetic, voicing their appreciation of DeSantis' disclosure of his affiliation. "Many editors have pointed out your straightforwardness as an example of honorable editing by an agent," an editor known as Buster Seven posted. "I agree with their assessment." DeSantis' edits, which began in October of 2008, included rewriting, removing, and editing lines, including several edits to references of Gingrich's marriages, according to Wikipedia edit records, which are published and publicly viewable on the site. The edits may include repairing "vandalism," such as incorrect or biased information, posted to the articles. From the introduction to an article on Callista, DeSantis struck: "She met her husband met while he was in the House, and had an affair while he was conducting the impeachment investigation for President Bill Clinton." On a separate occasion, he removed lines about Gingrich's first divorce and remarriage which said he approached his then-wife in the hospital following surgery. "Newt came up there with his yellow legal pad, and he had a list of things on how the divorce was going to be handled. He wanted her to sign it. She was still recovering from surgery," the article read. When a $500,000 credit line held by Gingrich at luxury retailer Tiffany's made headlines, references to the account were added on Wikipedia, and DeSantis edited those references, including material supportive of his client published in news articles. In April 2009, he deleted several lines on a House ethics investigation of Gingrich, replacing them with material more favorable to the former House speaker. DeSantis adjusted language describing his boss' position on waterboarding and climate change. Another edit corrected the name of the church choir of which Callista is a member. Minutes after posting his first edit to the site - which reworded the characterization of one of Gingrich's books - DeSantis created a user profile where he disclosed that he is employed by Gingrich. He also disclosed his connection to Gingrich in a note accompanying the first edit. "I am the Communications Director for Former House Speaker Newt Gingrich," he wrote on the profile. "I created this profile to submit edits to his article while being fully open about my affiliation." The site discourages edits by individuals with an interest in public understanding of the subject, but says an "editor with a self-evident interest in the matter turning up on the talk page is an indication that they are playing it straight." Talk pages are editorial discussions within the Wikipedia community, and in the months since his most recent edit to the site, DeSantis has posted almost 50 times on these pages. The website BuzzFeed recently noted 23 edits DeSantis made to Callista Gingrich's Wikipedia biography.DeSantis is far from the first aide to politicians, businesses, or public figures to make or suggest edits to the site. Aides to several senators, including the current Vice President Joe Biden, have previously edited their boss's Wikipedia entries. Biden's office said the edits were intended "to make it more fair and accurate," according to a report, and other offices said their editing was to correct factual issues. And in other instances, editing of these articles has itself become news. Following former Alaska Gov. Sarah Palin's mischaracterization of Paul Revere's American Revolution ride, her supporters edited Revere's Wikipedia page with Palin's version of the story. In these situations, Wikipedia editors frequently restrict edit access to articles. Gingrich's article is currently under one such level, "semi-protected," which bars non-registered site visitors from making edits. – CNN Political Producer Shawna Shepherd contributed to this report. OMG, why would anyone want Gingrich as POTUS? He is such a dirtbag. If New becomes president you can bet he will have Bush, and anything that happened from 2001-2008 removed from Wikepedia and history books as if nothing ever happened. If President Obama tried anything like this regarding his history, Republicand and conservatives alike would be on here KILLING him about it. Republicans are some of the biggest hipocrites around. Republicans rewriting history again. Aren't they satisfied with the job that Fox News does? 1) Reagan was a terrible president who slept through most of his administration and ran the national debt up to record levels. However, he did sucker a lot of Americans into believing he was great. 2) The current candidates are really Bush Republicans, not Reagan Republicans. Nobody is suckered into believing that Bush II was anything but an abject failure. Isn't this type of media control the exact sort of action taken by communist governments? Imagine what Gingrich would try to do from the Oval Office as commander-in-chief. Your party is over NEWT! No shame in your game....pack up and head home!!!! This tactic of using half-truths and hiding information is reprehensible. 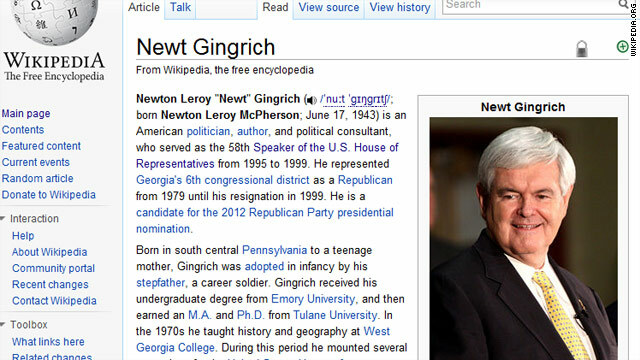 Thank you Wikipedia for calling attention to this shameful activity, which sadly reflects how Newt has led his life. How can truth be edited? In the past this kind of activity was thought to be central to Communist Russia, and North Korea. Does this mean that the republican party, has embraced (once thought of as criminal activities), to enhance political position? And if they have, should not the public be aware of true history, and the repercussions of allowing such ideology access to power? Dont claim all Republicans rewrite history. Anymore then Clinton editing his profille means all Democraps have. Pointing to Newt and avoiding VP edits of his boss Obama , REALLY ! Neither should be or should have been President of this country ! Disclaimer clearly reads NOT to post if you are connected to the subject . However, if he loses, he can say (when Rom-money falls flat) "I could have beaten Obama." Nobody could prove differently, and Nut would be sitting where he is most comfortable: on the sidelines, running his mouth, fooling the fools, and making big money. Is this a surprise to anyone? Newt has been attempting to re-write history for as long as anyone can remember. Did anyone actually think it would stop now? Oh puleeeze! Why is anybody shocked at this when they have been revising (read re-writing) HISTORY textbooks in Texas, and many other states for YEARS?! The re-writing of history, and what to include in science textbooks concerns me way more than the Newtered trying to make himself less odious on Wilkepedia. "After three days of turbulent meetings, the Texas Board of Education on Friday approved a social studies curriculum that will put a conservative stamp on history and economics textbooks, stressing the superiority of American capitalism, questioning the Founding Fathers’ commitment to a purely secular government and presenting Republican political philosophies in a more positive light"
Newt the revisionist strikes again. What a waste of bandwidth and oxygen he is. How can the truth be edited? By repeating a lie over and over until it becomes the truth, for one. By removing the truth from books, and publications. And the answer to your last two question is a resounding YES! Republicans do in fact embrace Communist tactics to suit their own purposes. All Gingrich wants is the truth........not all of it, of course. Just the facts that are positive. Sometimes, however, not ALL the facts are flattering. "You cannot be President of the United States if you cannot be honest and candid with the American people". both of you are now disqualified. No Freedom of Press under this man. As a historian, he grade out with an "F". Doesn't Newt claim to be a historian? Maybe he is wanting to change his career and become a fiction writer?